… and the IFU Awards 2017 go to: Paul Zwiker and Erbslöh Geisenheim AG! The IFU (International Fruit and Vegetable Juice Association) has awarded one company from the juice industry for innovation and one person for his long standing active support of the juice industry: Erbslöh received the “IFU Award for Innovation” for their FloraClair® technology, Mr. Paul Zwiker received the “IFU Award for Significant Contribution”. 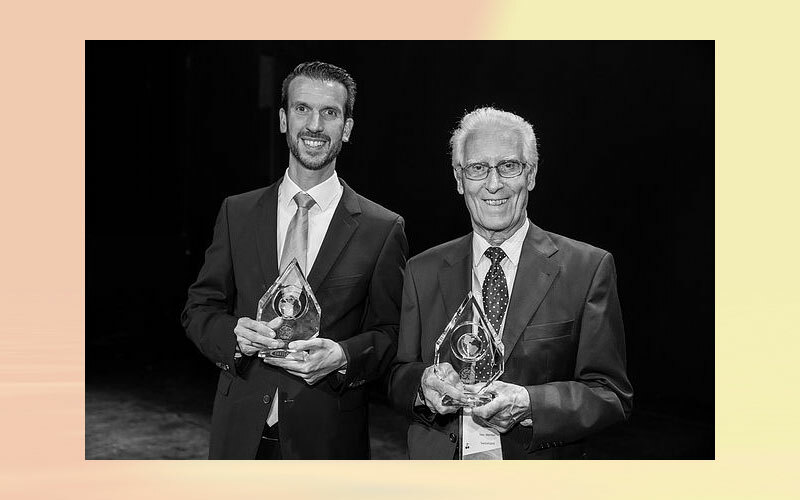 The IFU (International Fruit and Vegetable Juice Association) has awarded one company from the juice industry for innovation and one person for his long standing active support of the juice industry: Erbslöh received the “IFU Award for Innovation” for their FloraClair® technology, Mr. Paul Zwiker received the “IFU Award for Significant Contribution”. Both awards were presented during this years` Juice Summit Gala Dinner in Antwerp, Belgium. For the second time in a row, IFU received several excellent nominations for their annual innovation and significant contribution awards. The executive committee had the difficult, but rewarding task of deciding the final winners. Finally, the awards could be presented at the Gala Dinner of the Juice Summit held at De Zuiderkroon on the 4th October, 2017. They were introduced by IFU Vice-President Kees Cools and presented by Maria Schlaffer (Marketing Director) and John Collins (Executive Director) . The “IFU Award for Innovation” was awarded to Erbslöh Geisenheim AG for their FloraCLair® method: FloraClair® and Tannivin® Galléol are used as the optimised fining combination to facilitate a technology free from animal products for fruit juice or fruit-based beverage production. The fining combination of a specially selected quality phyto-protein from peas with a select precipitation tannin is a successful and reliable concept for vegan fining and stabilisation of fruit juices and fruit-based beverages. The completely plant-based fining concept, which not only dispenses with animal products compared with the conventional gelatine-silica sol fining, but also avoids mineral precipitation partner silica sol and the associated potential source of aluminium discharge, is particularly innovative. Combined use of FloraClair® and Tannivin® Galléol is a fully fledged, practical replacement for customary fining methods as with gelatine and silica sol, and the good news is, in addition, that existing technological facilities can be used. The award was accepted by Dr. Robert Könitz, Business Manager Fruit Processing at Erbslöh Geisenheim AG. The “Award for Significant Contribution” was awarded to Mr. Paul Zwiker for his long standing active support for the juice industry, associations, summits, workshops and seminars. Paul Zwiker has received his Diploma as Food Engineer 56 years ago at the Federal Technical University Zurich. Following that, he worked at Obipektin, became General Manager for Obipektin in 1970 and CEO of the Obi Group in 1979. He has held this position until his retirement. He has volunteered in various associations and organizations: The Swiss Association for Food Science and Technolog, FIAL (Federation of the Food Industry), Swiss Ministry of Trade, International Pectin Producers Association and Swiss Fruit Union. Most importantly for IFU, he has also been IFU President for many, many years and in this position started to establish international contacts also outside Europe, travelled through various countries and has been a true ambassador of IFU. Not only could IFU always count on his outstanding expertise, but also on his entertainment abilities: at IFU social events he has for example taken over the piano and given the official piano player a rest. It was a big honour for IFU that Mr. Paul Zwiker could come himself to Antwerp to receive the award on stage.